Dr.Malpani's Blog: Why don't Indian doctors use EMRs ? Nice post! Now I know Why don't Indian doctors use EMRs? Thanks for sharing this post. I enjoyed reading it. Keep posting. Shouldn't the government hospitals start this practice? Everyone else will follow. The World is going paperless, and here RSBY Insurance companies want us to go back from Electronic medical records to physical paper hard copy records, inspite of having a fully authenticated,secure total paperless system of EMR with ICD 10 coding in our rural hospital, or they threaten us with de-empanelment. Isn't it a retrograde step? You have very rightly pointed out the reasons why the doctors today stick to the same methods which have prevailed since decades. The technological advancement in field of equipment and treatments fascinates them, but when it comes to EMR they prefer backing out. EMRs exist in India since very long; still more than 70% of the medical fraternity use it for maintaining their appointments only. They prefer writing the prescriptions on their letter heads. Even big private hospitals are not able to use EMR to manage all their patient records like the operative summaries, detailed diagnosis, daily charts for indoor patients. Lot of things are still done using paper. And the patient has to carry all of them in every visit. I myself have experienced this when my mom-in-law was undergoing treatment for cancer. Her complete treatment was done at one the best private hospital of Vadodara (an ISO 9001:2008 institute). For three long years, we carried all her documents X-Rays, Operation details, CDs (almost 3 bags full) wherever we got her admitted for further treatment. The hospital authorities never referred to their EMR records and they always asked us to present the required report. Whenever there would be an emergency to take her to the hospital, we had to run looking for her medical records first; we knew that would be the first thing we would be asked for. I always wonder how to doctors treat patients who come from far off cities, what if they don’t carry their documents, and can that lead to wrong treatment? In 2010, before launching our product in the same domain we did a survey across Doctors running their own private hospitals in Vadodara and we found few more interesting facts that do not let them go for a complete automation. The lack of tech-savvy staff is one such prominent reason. Even if they manage to train the staff, it’s tougher to retain such a talent. Once the person leaves the job they just don’t have any way to refer to their records so they feel comfortable in their traditional methods of record keeping. 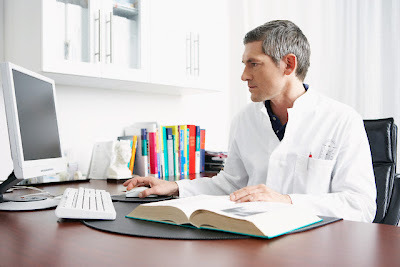 Most of the doctors are themselves not tech savvy and its gets difficult for them to get used to the EMR, moreover they are not able to judge whether the EMR has all the features that they need. The EMR UI is just not user-friendly or intuitive enough for people to be able to operate through it. And when a doctor is flooded with patients, he hardly has time to look for the right option in the EMR. We at PurpleDocs aim at bridging few of the above mentioned gaps and enable the medical fraternity to maintain their patient records without changing the way they work. Doctors can enrol for our service without have to pay anything. They can pay as they use our service. The software does not need any installation; the doctors can carry all their records in the form of a searchable database in a CD or USB and can run it on any PC. We also provide access to their records online. We digitize the paper based records and tag all the records (X-Rays, MRI, Bills, Reports, CD) on customised tag fields chosen by the doctor. We have laid special emphasis on making the UI simple enough; it’s as easy accessing your e-mails. We have been providing this service from last 1.5 years to more than 20 hospitals across Vadodara. We are planning to expand our service soon to other parts of the country. You can find out more about us from our FAQ page (https://www.purpledocs.com/Html/Faq.jsp). The question is 'are there any "good" EMR software solutions available for Indian doctors need' ? If there are, please someone post few of them here for the benefit of all. If there are none, and if someone needs one how can we know what is the demand there. Hello Mr Malpani..i appreciate your findings about the Indian healthcare system. Presently i am working on a research report on the North America healthcare IT market. While this study i am understanding the insights and the vast impact of healthcare IT on healthcare delivery. I see India as a growing market for the healthcare IT with a CAGR of more than 23%. I am a MBA hospital and healthcare management graduate from symbiosis, pune and want to work for healthcare IT adoption in India...kindly contact me if we can work togather.